Today we said a temporary good-bye to Riga and moved on to Cesis for the Baptist Song Festival. But first we had the distinct pleasure of sharing pancakes with dear friends from home! 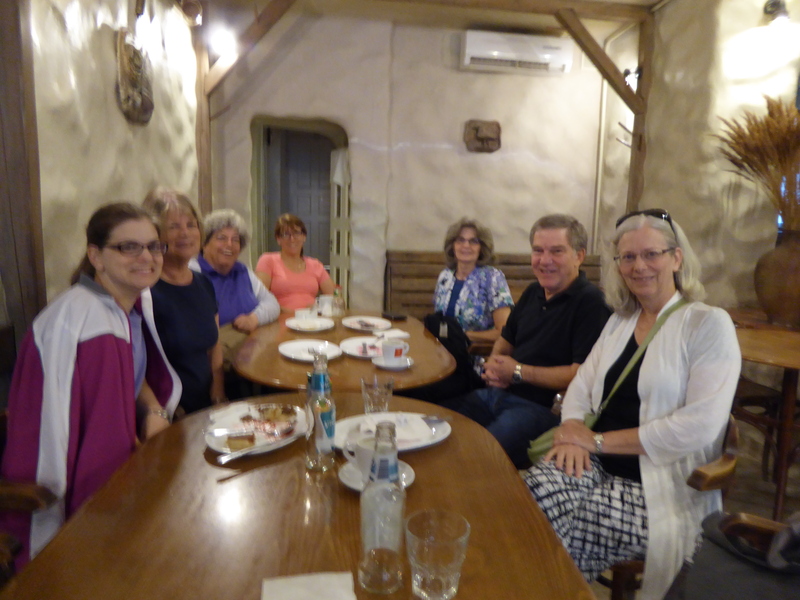 We met Marc and Carol Andresen, their daughter Katey and long time friend and ministry partner, Paula Hewitt.These friends from Corvallis are in Latvia for multiple purposes. Next week they will lead an English Camp in Madona in the central area of Latvia. Tomorrow they will enjoy the wedding of a young friend from Matthews Church. This young lady spent 3 weeks with them in Corvallis many years ago and tomorrow they are overjoyed to watch her take this big step in her life. It was so much fun to sit at a table and talk and talk and talk about our Latvia experiences! Please pray the favor of God on the English camp this next week. We spent some time this morning packing and giving the apartment a good cleaning prior to our departure. I exercised my faith again by riding the rickety elevator up to the fourth floor and then riding it back down with all of the luggage! I feel intrepid. 🙂 As we said good-bye to the apartment we were accompanied by thunder and lightening and a torrential downpour, but praise the Lord that the major rain stopped before we actually needed to load the van. Our van driver is Helvis — the really fun young man we met last week at the Rozenfelds. Helvis is training to be an airline pilot and completed some testing this week in Lithuania. He was a good driver and a very kind young man — I would trust him to fly me anywhere! Today he drove us to Cesis, Latvia home of this year’s Baptist Song Festival. If you followed the blog Steve and I kept when we were in Latvia in 2014, you may remember that Cesis is home to the Cesis castle and museum and that the castle is the first place the Latvian flag was raised on the eve of freedom. This is a beautiful and very inspiring place. We stopped in Sigulda on the way to Cesis so that I could post a package to Suburban, but I think it might actually have been Laima’s kind and sneaky way to let us get an early glimpse of Martina. On Sunday afternoon Liz, Linda and I will head to spend a couple of days and nights with Martina and Sandijs, her husband (and her kids too)! But we have been very eager to see each other again, so this few extra minutes and hugs were true treasures. Our hotel in Cesis is very nice and honestly we won’t be spending much time in it. The song festival is wonderful! Today we heard several choirs sing under the vaulted arches of St. Janis Cathedral. Then we were treated to an excellent piano concert in the local concert hall and late tonight we enjoyed youth worship bands back at the cathedral. The whole experience was so uplifting and beautiful. A worship team from a church in Texas, a sister church to Cesis Baptist Church, led us in “Oceans” — it was a very sweet experience worshiping together in an ancient cathedral. Tomorrow will be a full day of choirs and other music opportunities scattered throughout Cesis. Then on Sunday there will be a major united worship service and united choir for all here. It is an amazing experience to walk to these various events and have people shout out our names and welcome us heartily! We KNOW people here and they know us!! Isn’t that astounding! Our hearts are full tonight and we’re looking forward to what tomorrow will bring!